Top and popular musicians in the sub-region are bracing themselves to light up the first ever ECOWAS musical festival (ECOFEST), scheduled to be held on November 16 at the National Stadium in Freetown. 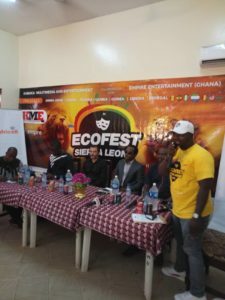 ECOFEST 2018, which was officially launched at Hotel 5-10 on Friday, October 5, will feature top musicians from Sierra Leone, Guinea, Ghana, Nigeria, Liberia, Senegal and The Gambia. The Kabaka Multimedia Entertainment (KME) music label is partnering with Empire Entertainment of Ghana to host the event, which has the tendency to ensure the country’s music climb another level. Chief Executive Officer of KME, Abu Bakarr Turay, said he did not only believe in dreams but was of the view that whatsoever one sets their hands on doing, must be done diligently. In just under a year and half in the industry, he prides himself to be one of the country’s development oriented citizens that has been working assiduously to take local music to the international level. He told his audience at the official launch that in spite of many challenges facing the music industry, he has been able to create a platform to not only empower artistes under his music label but also bring them to the world stage to showcase their God-given talents. “This is the reason for ECOFEST in Sierra Leone. I realised that Sierra Leone music was only playing in the country. I want to take it to the international arena because I want to have local talents competing with their international counterparts. We are losing lots of revenue and spending more to bringing international musicians whilst our local artists are paid pittance,” he said. 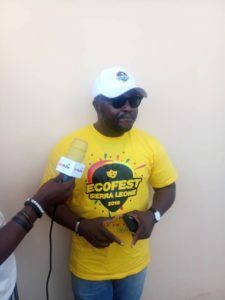 According to him, ECOFEST will serve as a platform for international musicians to envy and always want to be part of it and that his dream of taking Sierra Leonean music to the world stage began after meeting with West Africa’s music promoters and producers like Michael Collins Ajereh aka Don Jazzy, chief organiser of Ghana meets Naija, and Anokye Adisi aka Bola Ray. In his keynote address, Godfather of Sierra Leone music, Jimmy Bangura praised Kabaka for having a bigger dream as an individual for the music industry. “ECOFEST will bring a positive turnaround in the music industry. This is the only way we can showcase our continent to the rest of the world with good music and exceptional talents,” he remarked. According to him, Sierra Leone has talents but lacks the right platform to expose them internationally. With KME, the music legend noted that the country’s music would grow to higher heights. He warned local musicians against imitating Nigerians or Ghanaians artistes, rather encouraged them to sing in their own local languages and beats. “We can mix ‘bubu’ music with hip hop just to showcase what we have in our country,” he added and called for a good collaboration between disk jockeys and musicians for efficiency in the industry.